Amazon.com to help you get started! 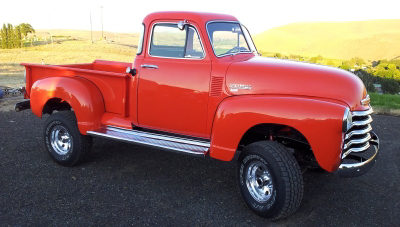 Early in 2015, Rick Sandford sent us a picture of his 1953 Chevrolet 1/2 Ton Pickup for our Picture Gallery. Rick mentioned it had been restored for a second time, using a 1950 5-window cab because he liked the driver side vent, along with the wing windows. He also decided to convert the truck to a 4x4 using a 1966 1/2-ton closed knuckle front end, shortened on the left side 3.5" to match the original frame spring width. While he was at it, he added power steering. I asked if he wanted to share more of his story about the truck, the history and the 2 restorations, and lucky for us, he did! Rick has taken his truck all over the Pacific Northwest, getting to as many shows as he can, while promoting the 4th of July Blues Cruise Car Show and Cruise he puts on in his hometown of Ione, Oregon. It's held every year on the 4th of July and the proceeds from the show help fund the Ione FFA Chapter for their national trip. You can find out more about the show on the event Facebook Page. After sharing Rick's story and pictures on our website, many of you commented at shows or through email how much you enjoyed reading about it and quite a few of you were able to see the truck and talk with Rick at show's this past summer. We'd like to share more stories and pictures on the history of our viewers cars and trucks, like we did for Rick's '53 Chevy. Would you like to see your story on our website? Maybe you've had the car since high school or perhaps it belonged to your Dad or Grandfather? Maybe there is no history to the vehicle, but you want to tell us about it anyways...that's ok too! We want to let others know about YOUR ride! Once we receive your information, we will contact you by phone, so please include your phone number. Your phone number will not be included in the story, but we do want to make contact with you to let you know when we will post your story on our website. If you don't hear from us after a couple days, please call us, in case we did not receive your email/mail.